. : Farm Forest Line - Stand measurements:. 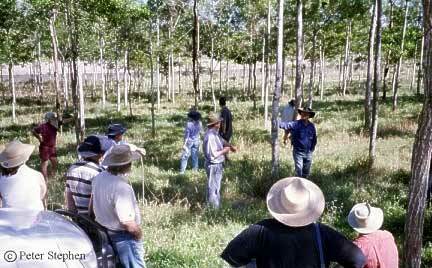 The diameter of every tree in the sample plot can be measured using the methods outlined in Diameter. While measuring diameter, the form of the tree should be inspected and a form factor (see Form ) recorded along with other points of interest. It is also worth recording the pruned height of each tree. One simple way of doing this involves using a graduated extension pole, such as those used for pole pruning, and measuring the pruned height to the closest 0.5m. Measuring the height of trees can be difficult and time consuming. Fortunately, the height of the tallest trees in a plantation or native forest are usually quite uniform and therefore, rather than measuring the height of all trees in the sample plot, it is common to select a sub-sample. In most cases a number of the fattest trees (largest DBH) of good form are measured for height, this is called the "Mean Dominant Height". The Mean Dominant Height can be estimated by measuring the heights of the 4 fattest trees of good form in each plot then averaging the height of the 3 tallest trees to calculate the Mean Dominant Height (See Tree Height). Where there is more than one species or age class, it will be necessary to determine a Mean Dominant Height for each. Stand Basal Area (SBA) is simply the cross-sectional area of all trees at breast height per hectare of forest or plantation (m2/ha). Stand Basal Area can be used to estimate stand volume and is a useful measure of the degree of competition in the stand. It is often quoted when planning thinning prescriptions. In some areas, and for some species, volume tables and volume equations are available. Growers in traditional plantation growing regions can contact the larger plantation growers for details. For those in southern Australia, the Farm Forestry Toolbox http://www.privateforests.tas.gov.au/downloadindex.htm, has an electronic tool that may be used to approximate tree volumes. Current Annual Increment (CAI) is the increase in volume at a particular age and is determined by annual measurements of standing volume. In dense plantations, the CAI will increase rapidly in the early years, up until competition for light, moisture or nutrients causes CAI to reach its peak. The decline in CAI can be more rapid than the early rise. In a mature native forest, the CAI is often close to zero, meaning there is no change in the total wood volume on the site from year to year. For some trees to grow others must die. When the CAI drops to the point that it is the lower than the MAI, then MAI will also fall because the increase in the next year will be less than the average. MAI is a much used (and often abused) forestry measurement for tree growth, but whenever a MAI or CAI figure is quoted, the age of the forest must also be known. This is because MAI changes with time. So for example, a plantation that has grown at 20 m3/ha/yr over 10 years might have 200m3/ha, but if grown for another 10 years it will not necessarily achieve 400m3/ha.